As a startup founder, you are focused on reaching product/market fit, collecting feedback from your first customers, iterating your product, building business partnerships and raising money. Now that first money has come in, and you can finally think about leveling up your startup marketing. You have the option to hire a full-time marketer, engage with an agency or contract a freelancer. The priority is to start your content marketing efforts and where possible implement marketing automation. There are common mistakes you can make which can be costly at such a sensitive phase. Together with Nick we are offering a range of services targeted at Startups. Here is our approach and how we help startups avoid the pitfalls of bad marketing. You have thought about your potential customers and their problems all the time while developing your product, but maybe never sat down to write those findings down on a piece of paper. Before rushing into creating content or booking ads it is important to think about the audiences you want to reach. We help you to do that. That is called creating a marketing persona. Here is a guide on how to get started with that, and by doing this it is possible to increase your ROI. 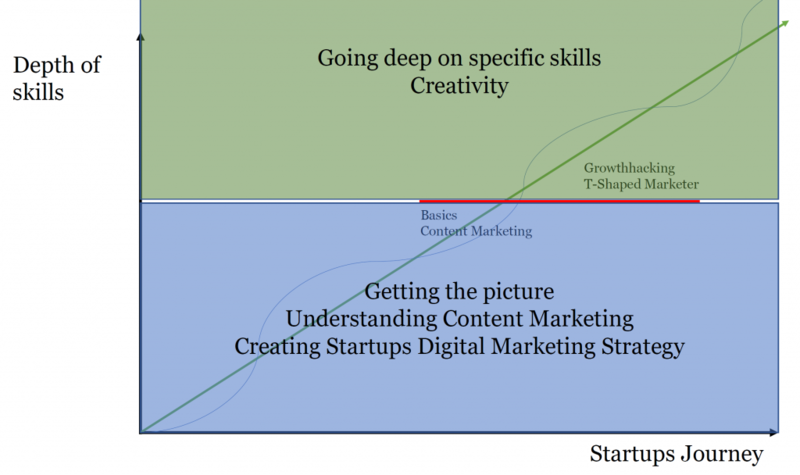 What should your startup marketing activities lead to? Are you selling a product to get shipped and your goal is to make a sale, or a software product and generate sign ups, or leads for sales to follow up? What does the customer journey look like, what does your funnel look like, and how long is your sales cycle? Based on your findings, from answering the questions above, you will be able to sit down as a team and work on the question of which content will interest your target groups. This involves a content brainstorming, putting that content in different categories along the customer journey, calculating resources and discussing what you think is needed to make this strategy succeed. Your content strategy should reflect your business strategy and give a clear understanding of where it leads to. Remember a nice mix between deep and shallow content helps widen your reach and makes the resources stretch a little further as well. Thousands of apps, tools, and software options are available to set up your marketing infrastructure stack. We help you focus on a few, guiding you to choosing the right toolset for your business. If you are new to this you will be overwhelmed by the options available and could get lost when trying to evaluate all by yourself, wasting valuable time. Newsletter and tools for subscription forms: What fits best for us? For blogging and social media – there are many options available. Depending on your resources you have to decide where to start and how to build a following. Each platform has its own technicalities, so pushing the same content to every platform though possible, is likely not to lead to any brand awareness or quality followers. Self-hosting is usually the better idea in the long term. Answering all those questions is nothing you can finish in one day, especially with people from different business areas involved. While you are working on answering these questions you will have to execute some activities right away. If you sent a monthly newsletter, don’t stop doing it now, if you run a presence on Facebook, keep doing it in the meantime. Depending on your marketing goals you can create a profile for your first full-time in-house marketer. We help you to find the right talent by creating the job description with you, giving you a list of potential interview questions, give feedback on potential candidates and then help with onboarding. 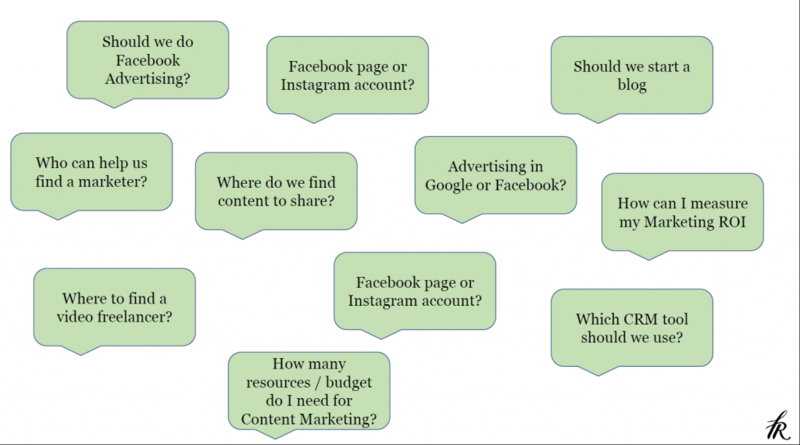 What are typical questions or topics a marketer should know about? Read: How to create social media strategy? How can we quickly set up landing pages? Which tools can we use to monitor our content marketing efforts? Which customer support tools should we integrate on our site? How can we see which companies are visiting our page? To which level can we automate our marketing? What tools other then Google Analytics can we use to analyse our traffic? Our approach is to work through these questions with startup founders and marketers, leaving you with a strategy on how to get started and avoid burning money. We help you to calculate a marketing budget to get this strategy alive. i.e. budgets for content creation can be very different: starting a video blog will require more resources than kicking off a presence on Twitter. Quickly setting up a single landing page with WordPress is easier then relaunching your whole web-presence etc. On average, how long does the creation of the blog post about X take and how much does it cost? How much time is needed to run your social media presences, what does outsourcing cost? We need a video interview with our founders to pitch to investors, how much budget is needed? As soon as your marketing department is getting the basics right and starting to feel secure in executing your daily business you can start thinking about a more creative approach. You will learn about the concept of Growth hacking, what is behind the ongoing buzz and what skills, methods (or unknown territory) you need to explore to take your digital marketing to the next steps. Blue = getting the basics right and the infrastructure in place. What are the top reasons to hire an agency like Fresh van Root to driving your startup’s marketing effort? 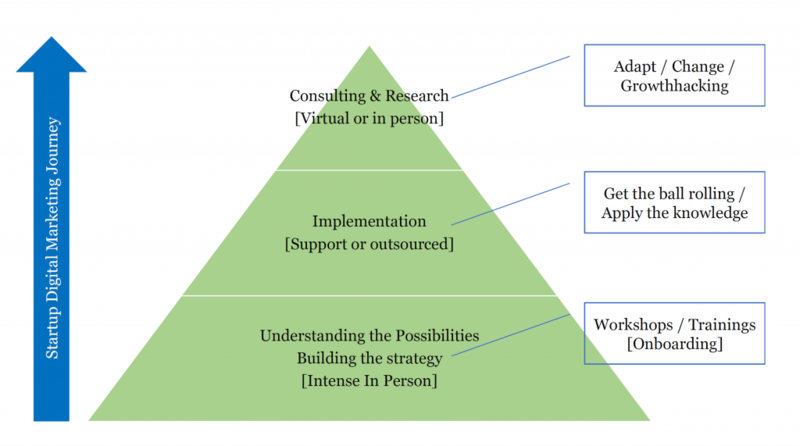 first-hour free consulting option or hire us to host an in-house workshop with your team to work on those questions. In any case, feel free to reach out to us via email to office[at]freshvanroot.com or FB, TW, etc. Thanks for this kind feedback. Good to hear that our conversation was fruitful. Great article, well done Rolf! . I should say it’s quality reading also for pre-funding start-up, and I’m the right example. When you are going to present your business plan to any serious and senior business angel or early-VC. Preparation of you marketing strategy will show them you are ready and have good vision for rolling out. It can help a lot when you are from more tech scene like AI, BioTech, VR/AR, to see both sides of your business. It was great meeting you and I hope that what we talked about helps. Looking forward to seeing the next steps with your startup.